Following nationwide defeats in the 2016 elections, the Democratic Party is on life support. After losing more than 900 legislators during the Obama Administration, the Party’s favorability has never been lower. In this article, I will explain why the Democratic Party’s favorability is at its lowest point in over 5 years. What Is The Favorability Of The Democratic Party? I’ll begin by addressing the first question you probably have — the Democratic Party’s favorability is currently 38.9%. 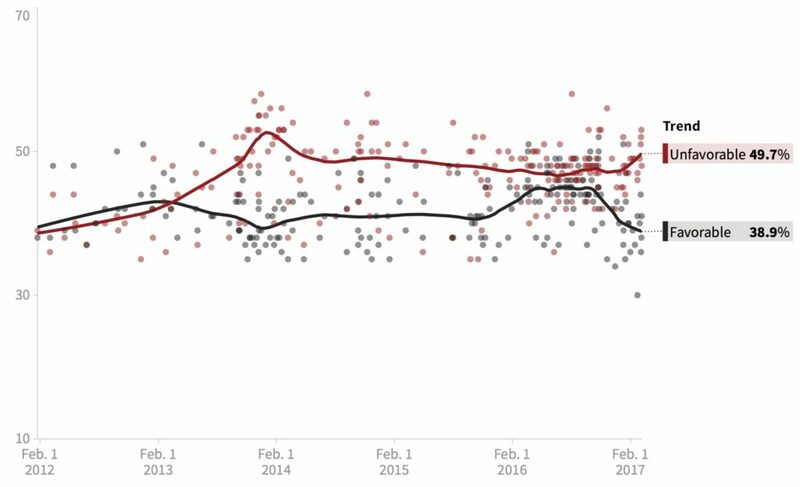 This is the lowest net favorability the Democratic Party has had in the last 5 years, with the previous low being 39.3% in December of 2013. Polling aggregate from The Huffington Post. The question still remains: why is the Democratic Party’s favorability so low? Progressives Versus Moderates: The primary between Bernie Sanders and Hillary Clinton, as well as the DNC Chair election between Keith Ellison and Tom Perez, were fights between progressives and moderates over the future of the Democratic Party. In both instances, the progressive candidates lost, leading to division within the Democratic Party. The disunity within the Democratic Party was partially responsible for the surge in 3rd party votes, as both Libertarian Gary Johnson and Green Jill Stein received a very respectable number of votes. Many of those who voted third party did so in protest of Donald Trump and Hillary Clinton. Trouble Within The DNC: The problems with the Democratic Party’s favorability start at the top with the DNC. The DNC was found to have treated Bernie Sanders incredibly unfairly (at the very least), which led to the resignation of Debbie Wasserman-Schultz as DNC Chair. 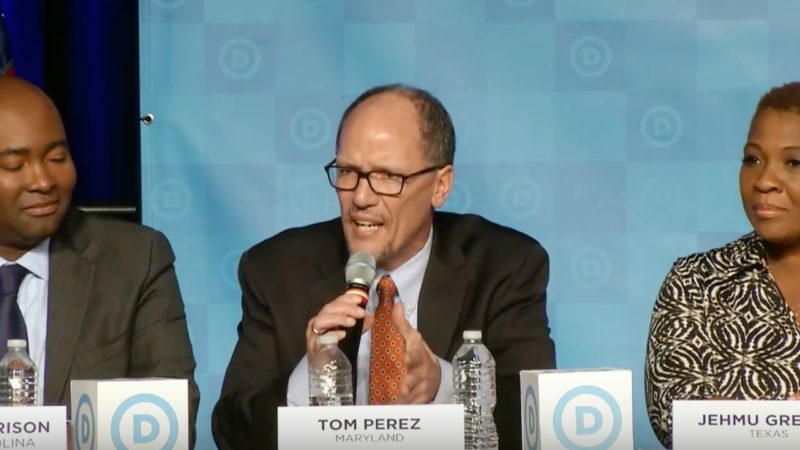 However, the DNC seems to be in a stage of reform, as the recently elected Chair Tom Perez immediately made Keith Ellison (D-MN) the Deputy Chair of the DNC. The most recent DNC Chair election was seen as part two of the battle between progressives and moderates over control of the party. The moderates (and Tom Perez) came out as victorious, but immediately moved to unite, rather than divide, the Democratic Party. Hillary Clinton: Like it or not, Hillary Clinton was a very unpopular candidate, and her unpopularity reflected upon the Democratic Party while she was the Party’s Presidential nominee. On top of losing the Presidential election, the Democrats lost many winnable down-ballot elections, including many Senate races in a year when the Democrats could have taken a majority. It should also be noted that the Republican Party’s favorability overall is 37.2% — a bit lower than the Democratic Party’s favorability. 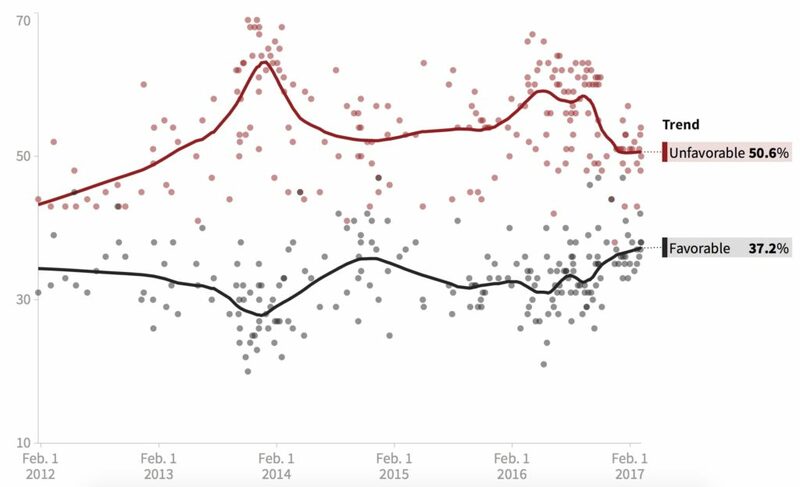 However, the GOP’s favorability is on a massive upswing over the past 4 years. In December of 2013, only 27.8% had a favorable opinion of the Republican Party. It seems abundantly clear that America is deeply divided across party lines, while a large portion of the country is still entirely dissatisfied with the highly partisan actions of both political parties, who can’t find common ground on almost anything. However, if the Democrats are going to retake seats in the government, they’ll have to do more than offer non-party line voters the simple message of “we’re not Trump.” Throughout the 2016 election, it was clear that voters wanted more policy discussion and more unique perspectives in political discourse. Though the Democratic Party’s favorability is lower than ever, there’s room to be optimistic. For all intents and purposes, Hillary Clinton is done running for office, and the Democrats will no longer have to carry around her dirty laundry. The DNC is coming together behind Tom Perez and Keith Ellison, while President Donald Trump continues to be historically unpopular. If the Democrats can find a way to turn their outrage into organization, they could have a very successful midterm elections in 2017-2018.